A dental implant is an option to replace a missing tooth. In this procedure, a small titanium shaft is surgically implanted (by an oral surgeon) into the bone and allowed to set. The bone grows around it forming a tight connection, which additionally slows or stops the bone loss that occurs when the root of a natural tooth is missing. Once the implant is firmly set in the mouth, the dentist then works to attach the replacement tooth onto the top of the shaft. 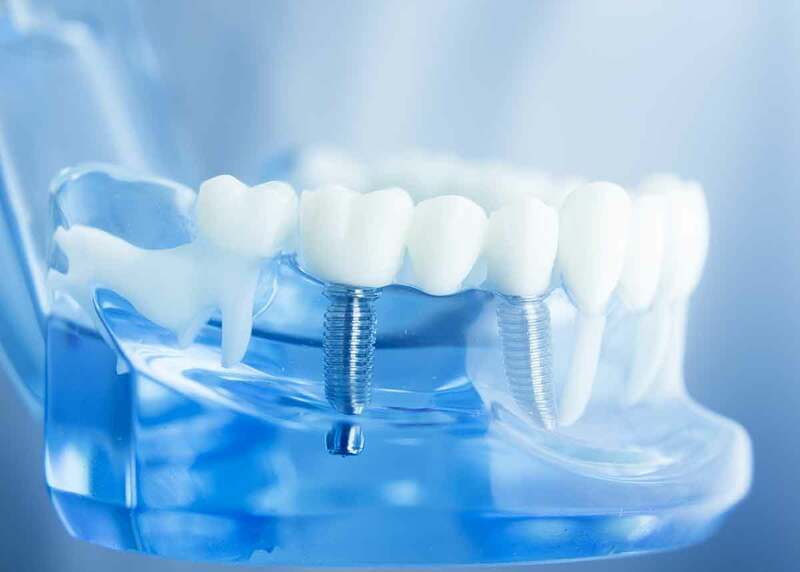 This permanent solution has the advantages over bridge work that it does not stress the surrounding teeth for support, and, should the tooth wear out, another can simply be replaced on the shaft.Implants can also be used as support as part of an implant bridge. This is an alternative to partial dentures, and has several advantages. First, there is no adjustment period to acclimatize the patient who, once the work is done, only feels teeth, not metal supports intruding into the mouth. Second, this slows the bone loss occasioned by missing teeth. Third, there is no discomfort or difficulty in eating. And, best of all, of course, they don’t have to be taken out all the time.